PPD Free Hair Dye There are 126 products. If you have ever had to deal with the negative effects of chemicals on your skin and hair, then you’ll know the importance of a high quality PPD free hair dye. The search for the right brand is often a nightmare when you need a hair dye that can give you the hair color you want minus the chemicals you need to avoid. That is why at Dye My Hair, we’ve compiled a huge range of ppd free hair color choices that will have you looking great and nightmare free. But before you begin, you will probably want to know everything you can about these ppd free hair dye brands before making your choice. Why is PPD Free Hair Dye Important? You might already be bored of hearing from every hair dye packet or hair dye professional that you have to test a small patch of skin and hair before using any hair dye. Well PPD is one of the reasons why your hair dyeing experience could go horribly wrong. The term PPD stands for Para-Phenlyenediamine which is one of the chemicals that go into making certain hair dyes. The purpose of this dye is to lengthen the amount of time that your chosen color stays on your head. Unfortunately for some, there is a chance of being allergic to PPD and that can mean bad news. So if you’ve ever failed a skin or strand test for a hair dye brand, it is possible that you might need your own non ppd hair dye. Of course it’s not just allergies that would make you want to choose ppd free variety of dye. Those with sensitive skin may find hair dye to be irritating on the scalp which may again be the result of PPD. If you like to change your hair color regularly or use multiple dyes in stages to get a special color effect, the chemicals can start to have an effect. You might instead prefer to use hair dyes without ppd to make your dye job as easy as possible. All the PPD Free Hair Colours of the Rainbow! Don’t think that by removing the PPD from a hair dye, you’re also losing the color. It is easy to get the best hair color without ppd. The only thing standing between you and vibrant hair is your imagination. With so many different color options to choose from, it’s hard to pick a place to start. It’s easy to see why people love to swap colors all the time when there is this much variety in the PPD free hair dye section. So which color will you start with? 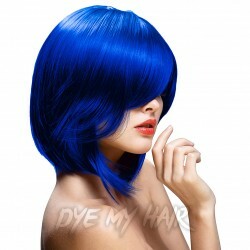 A blue hair dye is a popular choice for many. With shades ranging from the darkest midnight blue to the bright electric blue and even the pastel blue shades at the lighter end of the spectrum. Perhaps you’d prefer Green? No problem, or mix the two together with a turquoise or teal hair dye. Red, Yellow, Pink, Purple, Orange. There is a ppd free hair dye for every color that you could want in your hair. You will be so happy when you try it out for yourself and realize this can be your hair all the time. Which Hair Dye Brands are PPD Free? At Dye My Hair, we have two main brands that will provide you with all of your hair dye needs. Manic Panic and La Riche Directions go beyond the necessary levels for PPD free hair dye, making them a must have choice for anyone who cares about their skin. Both brands produce a hair dye without ppd and ammonia making them even less likely to cause skin irritation. Of course you will still need to test your skin before using either dye. If you have been looking through hair dye information, you may already know these brands names, especially Manic Panic which boast not just PPD and Ammonia free hair dyes, but also Paraben, Gluten, Resorcinol, Phthalate are nowhere to be seen in any of their colorful and easy to use hair dyes. Not to mention, they’re Vegan and animal-cruelty free. Not just any hair dye brand can achieve that. 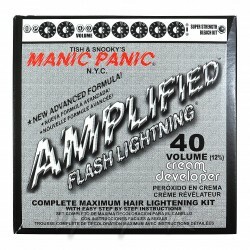 Manic Panic and La Riche Directions are semi-permanent options, lasting for up to 8 weeks at a time. As we mentioned earlier, PPD is used to keep color lasting longer, so you will struggle to find a permanent hair dye that will do the same job. But we think that there are plenty of reasons why Semi-permanent is a better choice anyway. We’ve already shown you that the world is your oyster when it comes to color and because they will only last for a couple of months, your color choice will fade and you can move on to the next fun and vibrant option that takes your fancy. No longer do you need to worry about bleaching back from midnight blue when you want to try forest green. Another big difference is the lifespan of semi-permanent hair dyes. Permanent hair dyes will have you mixing chemicals and if you don’t apply right away, you’ll lose the color intensity. This isn’t the case with dyes like Manic Panic. If you have more hair dye than you need, simply reseal the jar and use it again when you need a touch up. So if you need hair dye no ppd or ammonia guaranteed, the Manic Panic and La Riche Directions semi-permanent dyes are everything you could ever imagine. At Dye My Hair, we provide hair dye internationally to a number of different countries. The dyes will arrive in the post so you don’t even have to leave your house. So don’t hesitate to make your dream of colorful hair come true. Take a look through our range of PPD free hair dye and start planning. Whether you’re looking to make a shocking statement at a special event, need the best hair color for a crafty Cosplay, or just love the idea of having stand out hair wherever you go, the possibilities are just a click away!